Heinz ketchup is an iconic American brand, practically perfect in every way. Why mess with it? I’ve seen red tomatoes, green tomatoes, and even yellow and purple tomatoes in the produce department, but for years I’d only seen red ketchup on the store shelf. Heinz ketchup is an iconic American brand, practically perfect in every way. Why mess with it? In 2000, that’s exactly what Heinz decided to do, when it turned the ketchup world upside-down when they began rolling our vibrant, crazy-colored ketchup in purple, pink, orange, teal, and blue varieties. Heinz EZ Squirt’s first color entry was ‘Blastin’ Green’ and was created as a promotional ketchup in support of the first Shrek movie, and moms and kids came running. Each new color resulted in incremental sales volume. In fact, more than 25 million bottles of colored ketchup were sold, helping Heinz capture an all-time high of 60% of the U.S. ketchup market, before softening sales resulted in the EZ Squirt brand being pulled from the shelves by January 2006. 1. Target Audience – There’s no-doubt that this kid-friendly ketchup is fun and exciting. Heck, even the package shape is ergonomically designed for young kids’ hands. But the real purchase driver on this one was the movie tie-in. Kids wanted to be like Shrek, the big, strong, lovable green ogre they saw in the movie. Parents enjoyed the movie just as much as the kids, and they were more than willing to buy a novelty-colored ketchup (versus a sugary promotional candy) to keep the movie memory alive. At $1.79 for a 24-ounce bottle, it was a relatively small investment to keep the kids happy in the grocery store aisles and at the dinner table. But that’s not a good strategy for creating a sustainable brand. Kids have short attention spans and are easily distracted by the next new movie, toy, or superhero on the cereal box. And Mom is not going to keep buying a product that her kids stop asking for if she’s not going to use it herself. After all, red ketchup is just fine, kids love it, and it has been a stock item in her refrigerator for years. Plus, you’ll never have to wonder if you accidentally poured Windex on your fries instead of ketchup. 2. Timing – Timing is everything, and it’s no different when it comes to new products and line extensions. 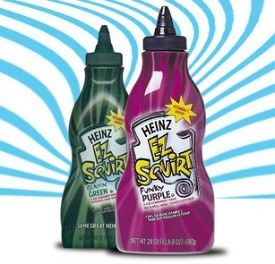 Heinz initially introduced EZ Squirt in green. Believable because of green tomatoes, it was a safe color to begin with. As incremental sales volumes skyrocketed, you’d think that the brand would be quick to react and roll out the next color. But instead of taking advantage of this momentum, they waited 2 years before introducing the next sku in the lineup. We’ll never know if it was due to manufacturing issues or simply short-sightedness, but it seems like someone dropped the ball. 3. The Product – The first EZ Squirt ketchup colors to make their debut were green and red. So you’d assume they were made from red and green tomatoes, right? We were right about red, but couldn’t have been more wrong about green. Making ketchup in outrageous colors required some re-engineering of the actual ketchup product. The vibrant color hues of EZ Squirt’s Blastin’ Green, Funky Purple, Stellar Blue, Passion Pink, Awesome Orange, and Totally Teal were achieved by stripping the red color from traditional Heinz ketchup and adding food coloring. And because the flavor had to be tweaked to taste just like traditional ketchup, it could no longer be called ‘tomato ketchup’ like the original red. We believe that Heinz compensated for this by fortifying it with Vitamin C to win the approval of Moms. But most parents are pretty health-conscious when it comes to feeding their kids, and EZ Squirt came along at a time when parents were becoming more and more cautious of artificial food colorings and its effects on kids’ behavior and allergies, so it’s no wonder EZ Squirt experienced a short shelf life. The abbreviated lifespan of Heinz EZ Squirt reminds us of a few key branding insights. 1. Novelty versus product extension. Novelty items typically have limited shelf life while product extensions are hopefully built for staying power in the brand portfolio. There is no comparison in the amount of corporate resources and capital required to create a product (high) versus a promotional item (low), so why not utilize your money in the most productive way? 2. Mom’s rules. We can never forget Mom when it comes to marketing to young children. She is the gatekeeper who you need to keep happy in the marketing equation. Mom is all about having a little fun, but the phrase “don’t play with your food” seems to hold true no matter what generation of Moms you are talking to. Additionally, Moms are wired to believe (and rightly so) that “Fake food is bad food.” If Mom suspects that the product isn’t as healthy as it should be, it will never make it into her shopping cart. 3. Grow your usage occasion to grow your business. Although the intent of wacky-colored ketchup in squeezable packages was to bring out the artist in your child in order to enhance their eating experience, kids were still squeezing it on the same foods–hamburgers, chicken nuggets, baked potatoes, and french fries. What if this had become a totally new condiment that encouraged kids to eat more fruits and vegetables? Blueberry ketchup that you could squeeze on sliced fruit or use as a dipping sauce for grapes, strawberries, or bananas would have grown the usage occasion and added interest to a sleepy category. Want more lessons in branding from products that lost their way? Check out more stories from our “What Were They Thinking” series.